All ultrasonic humidifiers requireclean water to ensure that the ceramic discs last for as long as possible. These filters have a clear housing so that you can easily see when the cartridge needs to be changed without having to open the housing. The thread is 1/2 inch BSP. 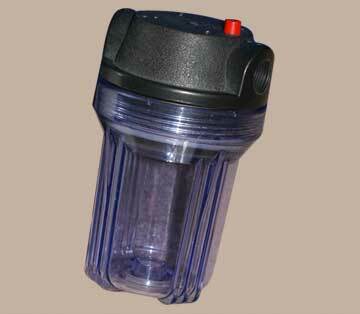 Our filters are supplied complete with 2 x 5 micron filter cartridges so that you have a spare cartridge on hand. Also included is a filter opening tool and a mounting bracket to place the filter in a convenient place near your fogger. These filters are ideal for greenhouse watering and misting systems to prevent sediment from blocking the fine nozzles. Many filters are not fine enough to prevent fine particles from clogging your watering and misting systems.